Jessica Bennett’s Kleo vamps up a classic silhouette. 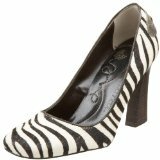 The curvy shoe sports an animal-printed upper in Zebra for an eye-catching look, and a tall stacked heel lends some leg-lengthening height. Jessica Bennett stands out by providing the sophistication and luxury of Italian design as a bridge brand. Focusing on details that make each shoe spectacular, this collection showcases a wide variety of patterns all with one common goal, to provide a feel-good factor for feet everywhere. The diversity of this line allows for the representation of fashion’s most influential trends, complete with an overall feel of romantic feminism. The unique styling of Jessica Bennett is left open to interpretation, so each woman has the freedom to accentuate her individual style. Modern construction provides an elegant, unmatchable look that is enhanced by the use of luxurious materials. Jessica Bennett has redefined women’s footwear, making shoes more than just an accessory.